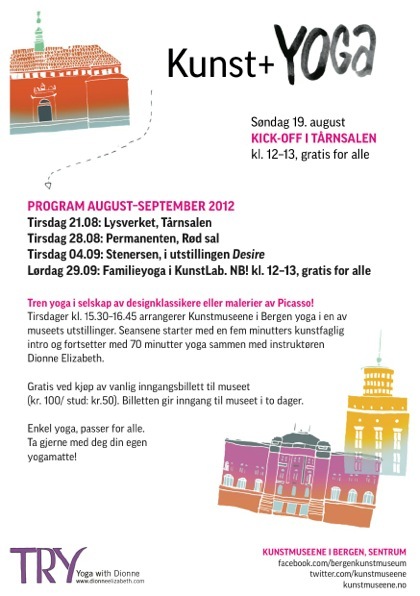 KUNST + Yoga FREE kickoff event this Sunday! After a rapturous time in May and June, we’re delighted to share the flyer for this season of events of TRY Yoga in “collabo” with Bergen Kunstmuseene! Come along for a frolic at our launch event this Sunday at 12:00 in Lysverket where we’ll hold yoga in the glorious Tårnsalen. The class will be followed by an optional tour starting at 13:00. For more information about the project, click here. Thank you so much for that amazing comment you left me! You are the instructor for yoga with art?